It is increasingly important to potentiate the use of wireless communication systems on board to enable the deployment of technologies like structural health monitoring and active flow control. Such technologies can have a positive impact on the safety and performance of aircrafts, reducing costs, carbon emissions, and improving maintenance cycles. Active flow control makes use of sensor and actuators installed at key positions on the wing to reduce the turbulent airflow. Since in a commercial aircraft the skin friction drag is a major fraction of the total drag, by reducing the main source of the skin friction drag, i.e. turbulent flow, significant reduction of fuel can be achieved. Complementary, Structural Health Monitoring monitors the stress applied to the structural elements of an aircraft by means of sensors embedded on the structure itself. This technology is able to predict structural failures and monitor the fatigue of the structural elements leading to optimized maintenance and increase safety. Nonetheless, the adoption of these technologies has been hampered by technological difficulties, as both structural health monitoring and active flow control require dense networks of sensors and actuators. As these sensor and actuator networks need to be wired to communicate with the aircraft and between them, the added mass, manufacturing and maintenance cost of the system defeats the benefits brought by it. Hence, wireless technologies, among others such as energy harvesting, need to act as enablers for the future adoption of structural health monitoring and active flow control in aircrafts. There are several challenges in the interconnectivity and how to achieve the desired objectives in a dependable and robust manner, compatible with a high assurance environment such as an aircraft, whilst minimizing energy expenditure. Active flow control requires measurements at high frequency and in synchronicity with each other, to be able to correlate sensor readings, especially from sensors in close proximity. In addition, reliable data transmission and data delivery mechanisms are required as well as security guarantees against data tempering. Security is a key element for these networks as an attacker able to exploit the network will be able to reduce the safety margin of the aircraft. Moreover, these wireless networks and sensor systems need to communicate and interact with the main data busses of the aircraft. Hence, the specification of bi-directional bridges between different types of technologies is required. Bridge protocols and interfaces must be specified which respect the constraints of the different networks and secured against external attackers. 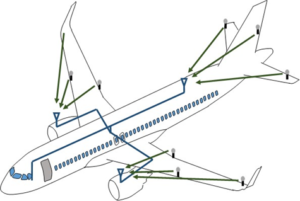 Since these bridges provide access to the internal aircraft systems they are of special concern, as they can negatively affect the overall safety of the aircraft.